Silver Maple Leaf coins are internationally recognized by investors as a reliable and safe precious metal option when buying silver. The official bullion coin of Canada, the Silver Canadian Maple Leaf is produced by the Royal Canadian Mint each year with the same brilliant designs as the gold, platinum, and palladium versions. Today, 1994 1 oz Silver Canadian Maple Leaf Coins are available to you online at Silver.com. Ships to you within protective flip! Seventh release year of Silver Canadian Maple Leaf coins! Mintage total of 889,946 coins in 1994! 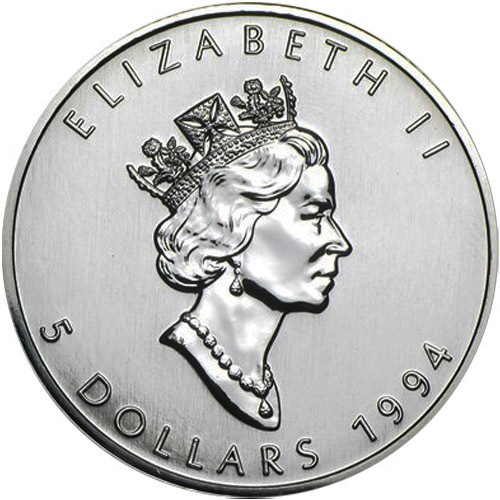 Obverse bears a portrait of Queen Elizabeth II. Reverse includes a sugar maple leaf design. National bullion coin programs like the Silver Canadian Maple Leaf feature design elements vital to the culture and society of the people from the nation in which those coins are struck. When it comes to the Royal Canadian Mint’s Canadian Maple Leaf series, the sugar maple leaf on the reverse is the ultimate symbol of the nation. As early as the 1700s, the maple leaf had become a symbol associated with Canada. By 1834, the St. Jean Baptiste Society made the maple leaf its emblem, and Montreal’s first mayor described the tree and leaf as “king of our forest; the symbol of the Canadian people.” As such, it’s only fitting to feature the emblem on the Silver Maple Leaf coin series. 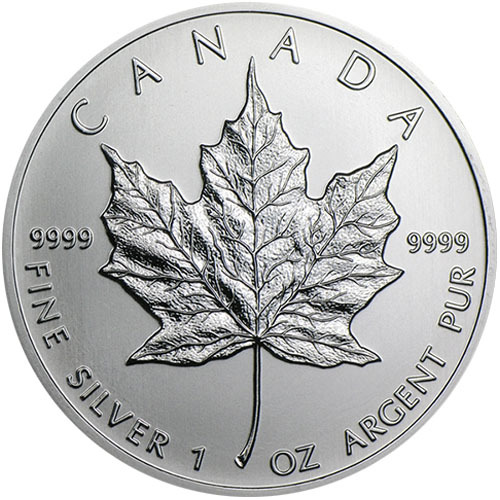 In the 1994 Silver Canadian Maple Leaf coin release, the bullion coin sank modestly in mintage from 1.133 million the year before to settle at 889,946. The drop coincided with declining demand for silver on positive economic performance in markets and rising prices for silver. Silver had hovered around $4.31 throughout 1993, but in 1994 surged as high as $5.75 per ounce during the year with a yearly average of $5.28 per ounce. The obverse of all Canadian Maple Leaf coinage features an effigy of Queen Elizabeth II. Her Majesty appears on all Canadian currency’s obverse side. This particular design comes from Dora de Pedery-Hunt and is the third-generation portrait to appear on Canadian coins since Elizabeth II’s coronation. On the reverse of the 1994 1 oz Silver Canadian Maple Leaf Coin is the sugar maple leaf design. The sugar maple leaf appears on the reverse side of all coins in this series and includes engravings denoting the nation of issue, purity, weight, and metal content of the coins. Please don’t hesitate to reach out to Silver.com if you have any questions. Our customer service team members are available to you at 888-989-7223, online using our live chat, or by simply sending us an email.